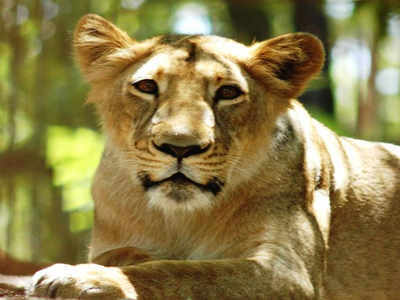 AHMEDABAD: A lioness entered Khamba village near Gir forest on Sunday morning and attacked three villagers, while they were working in the field. After injuring two, it dragged a third to the outskirts of the village in Visavadar leaving him seriously injured. The victims of the lion attack are being treated at Civil Hospital in Amreli. Forest officials said that two of the victims had received most injuries on legs, while one was seriously injured. The injured are Rajbha Jhala, 25, Vallabh Butani, 55, and Jenti Kapuriya, 45. Jhala was dragged by the lioness to the village outskirts. Two of the three are farmers and one a cowherd. After the incident, senior forest officials and trackers have been camping in the area to cage the lioness and release it later into the wild far from human habitation. Forest officials said that somehow the lioness was irritated and thus attacked the villagers. After the attack, the two injured in the fields were immediately attended by emergency services and villagers, while the third victim was traced to a small culvert nearby, where he was battling for his life. The rescuers found the lioness perched on a small mound around 500 metres from the victim. Ultimately, 108-EMRI staff and villagers managed to drive off the lioness, rescue the victim and send him to Junagadh. 108-EMRI officials said they had received the rescue call at 9.08am and a team including Sahil Ratapiya, Sohil Dhaduk and Bharat Jhala had reached the spot. Villagers informed them of the third victim who was seriously injured and lying near the outskirts of the village. "When the 108-staff reached the spot, they found that the lioness was sitting on the boundary wall and the victim was lying about 500 metres from it. Since the area was not motorable the staff had to go on foot risking attack. Along with the villagers, they drove off the lioness with loud noises. The victims were shifted to Civil Hospital in Amreli," said Chetan Gaadhe, district officer, Amreli, of 108-EMRI.